It’s now the 2nd half of the Race and teams set out on the 7th Leg with a clue telling them they’re flying to Auckland, New Zealand. 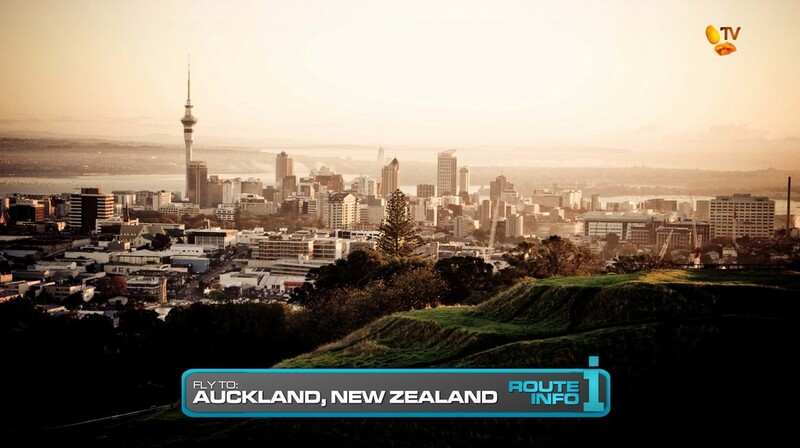 Teams will fly back to Santiago from Easter Island and then directly on to Auckland on LAN Airlines, arriving at 4am. 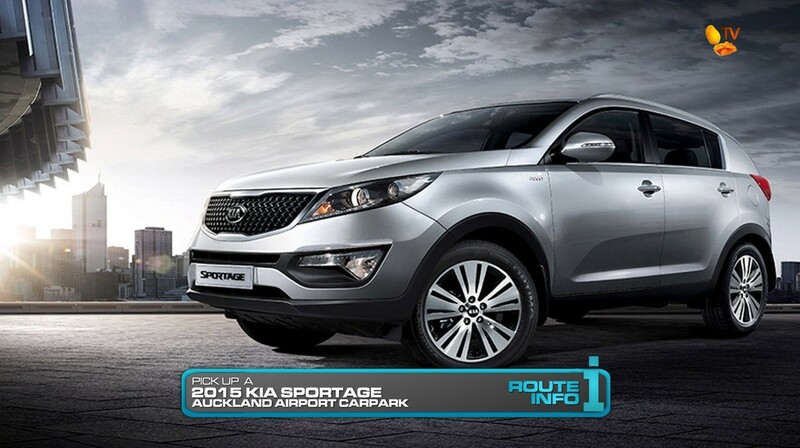 Teams will pick-up a brand-new 2016 Kia Sportage at the airport carpark with a clue directing them to drive 217 kilometers to the Rotorua Museum in Rotorua. The cluebox outside the museum reveals the Detour for this Leg: Clean or Dirty. 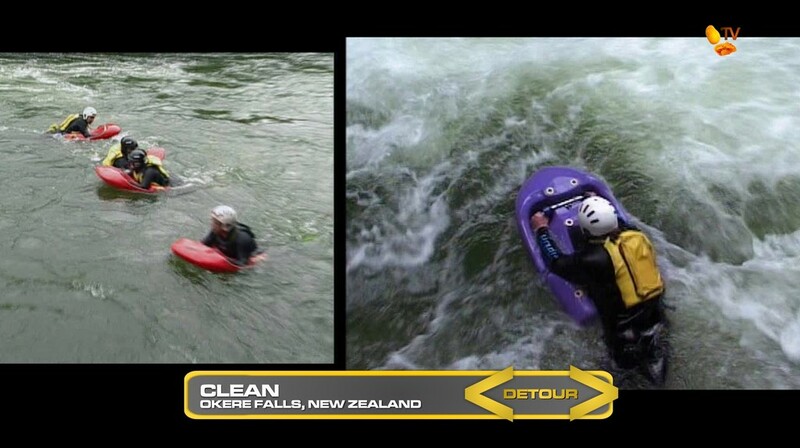 In Clean, teams must drive 13 miles to Okere Falls and participate in the adventure sport called river sledging. With the help of two guides, teams must complete a 1 mile course down the raging river with only a small board, called a sledge, for protection. In Dirty, teams must drive 10 miles to Hell’s Gate Geothermal Park and search for their next clue buried in the hot mud pit. 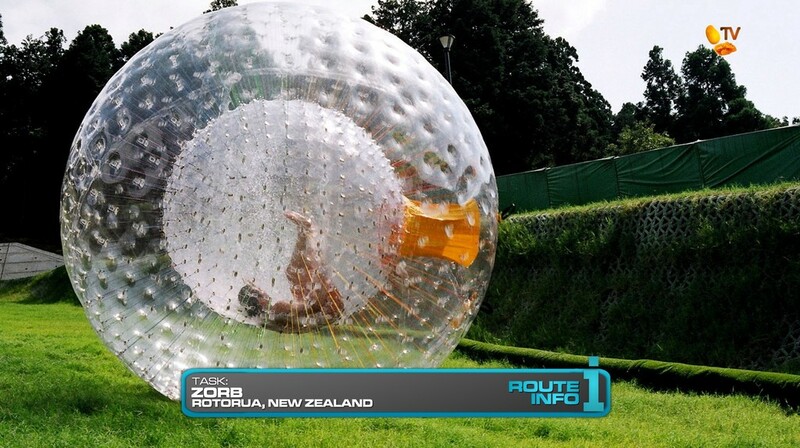 After the Detour, teams must head to Zorb Rotorua where they will have some fun in a zorb! 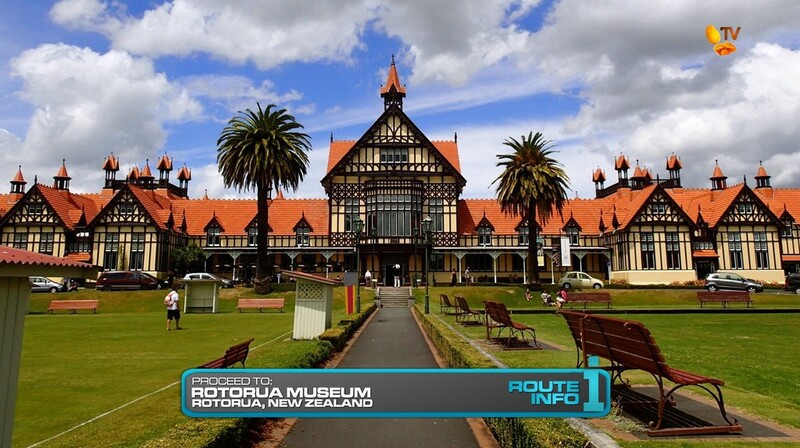 The first zorbing site was established here in Rotorua in 1994. And teams will get to experience the thrilling and fun sport of rolling downhill inside a plastic orb known as a zorb. Once they reach the bottom of the hill and roll themselves to the finish line, they will receive their next clue. 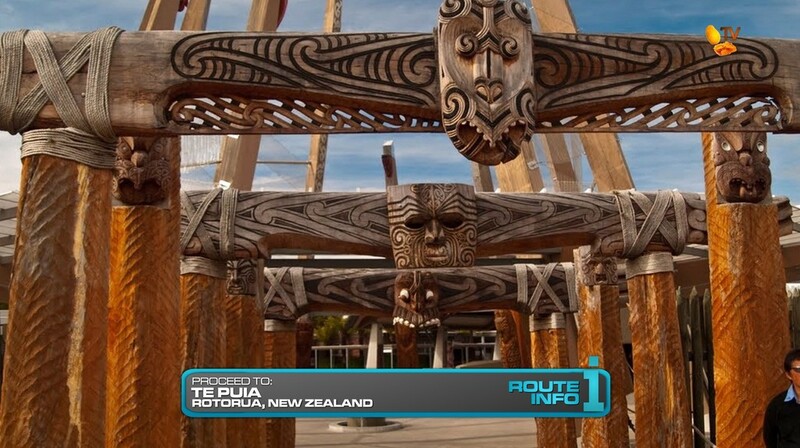 That clue directs teams to Te Puia where they will find the Road Block: Who wants a Maori good time? 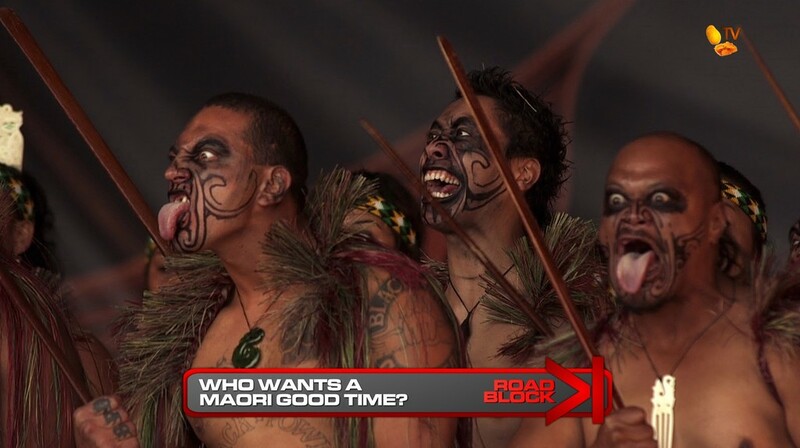 For this Road Block, teams will choose a drawing of a ta moko Maori tattoo and then search the dozens of Maori warriors to find one with a matching tattoo on his face. If they’re correct, the warrior will take them to their next clue. If incorrect, the warrior will take their photo and rip it up before teams will try again. 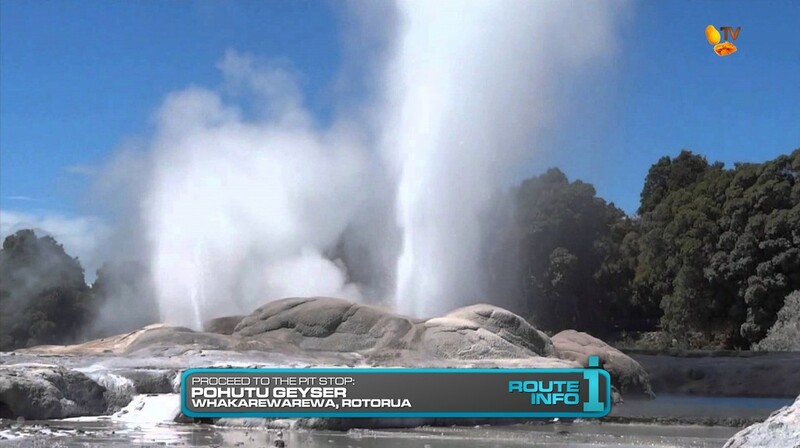 The final clue will direct teams to walk to the Pit Stop, Pohutu Geyser. Here, they will receive a very warm greeting. The first team to step on the Mat will win P100,000 courtesy of Shell V-Power Nitro+. And the last team sadly WILL be eliminated. Definitely wanted this New Zealand Leg. Pretty much recycling TAR5 and TAR13’s tasks, but of course, one could find more interesting tasks on a good scouting trip. Still, the tasks here are not bad. Zorbing is a must, of course. And the clean vs. dirty Detour is solid. Teams will either get wet or dirty, so that’s always good. And the Road Block is a straightforward TAR staple. I do feel like this Leg is pretty short. So again, hopefully any future real TARPH Leg would find a good mix of tasks and locations.